Pool Party is a summertime relaxation structure for the public. It is an urban living room under an archipelago of iberglass pools. Sitting at 60’ x 60’ and peaking at 30’ in height, it is a visible signal of leisure from the street. 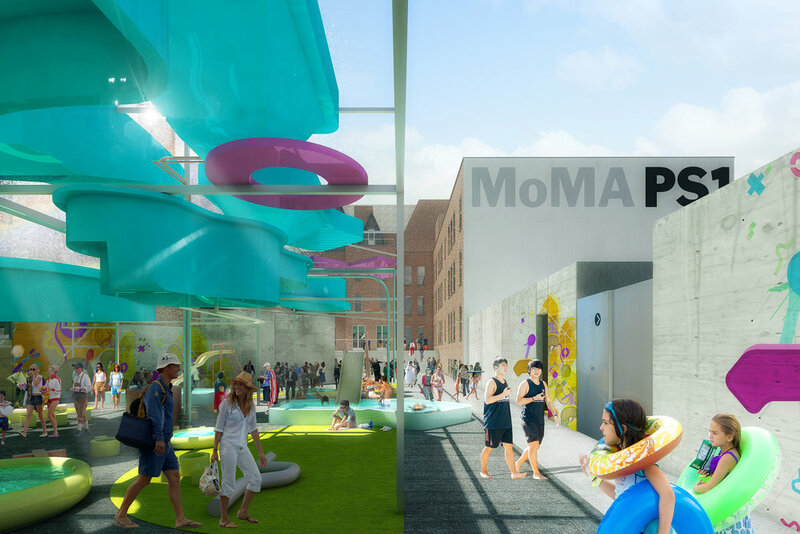 Pool Party is a canopy system that shields visitors from the hot summer sun, while introducing other cooling factors such as evaporative cooling, as well as shading devices that stencil the sun. It is a safe haven for hardworking people looking to take a weekend off, partake in some casual day-drinking, half-listen to an outdoor concert, and forget their worldly sadness. Pool Party is an economic diagram. It is a proposal that deploys a “catch-and-release” material strategy. Instead of exhausting more energy on the construction of cartoonish bubbles, we selected from a catalogue of existing industry-standard pools with qualities of curves we would have wanted to produce anyway. By preparing for a transport cycle, we would reuse undervalued pools and hoist them above the PS1 courtyard in an epic rescue mission for a collection of misfit heroes. The pools will then be either returned to the pool companies, or slungshot towards their next destination for someone else’s use. Most importantly, Pool Party is a love-letter to the culture of life in and around pools. The blue-glowing pool is more than just athletic equipment - it is a romantic space where people fall in love, get in trouble, and come of age. It is a place where we remember to forget, and at least for one or two weekends there should not be a worry in the world.